The 'WTWTA" DVD has the very rare quality of its Special Features actually complimenting the tone and thus enhancing the enjoyment of the main feature movie. While I like to see and read about the creative process of filmmaking, I prefer to experience this much later in the life of the movie after it's had time to breathe and establish itself in the context of cinema history. 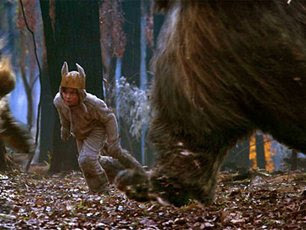 There are probably many more stories to tell about the making of 'Where the Wild Things Are', after all it took 3 years of publicized production and post-production difficulties bringing this picture to the screen. Without completely lifting the veil of the artistic process, we get a wonderful look into the unique filmmaking and production philosophy Spike Jonze applied to this story. Jonze has avoided using the awful word 'featurette' in describing his behind-the-scenes footage, opting to call his short 3-5mins segments 'Documentaries'. For instance, the short doc 'The Kids Take Over the Picture' shows the literal childlike influence Jonze wanted to create around the set. By inviting the children of the crew to be part of the production Jonze admirably never allowed the crew lose focus of the big themes of the picture. As for the movie... upon second viewing it holds up as a wonderful adaptation of a fantasy tale told with an admirable amount of creative restraint - a courageous work of art, a wholly unique experience, meeting and exceeding our high expectations. Under anyone’s else’s watch this film would have been turned into an fantasy extravaganza, replete which mondo special effects, overly designed fantasy worlds, fantasy creatures and Pixar/Disney sappy comedic tones. After all, it’s a familiar story, a troubled and lonely child retreats to his dreams where he finds a fantastical world of monsters, of which he makes himself king. The actual book is only 19 pages, and only about one sentence per page, a very sparse jumping off point for Jonze and his co-writer Dave Eggers. The film version expands on the opening pages of the book, showing us the lonely existence of Max a rambunctious and imaginative 11 year old who is too young to hang out with his newly pubescent sister and who receives little attention from her newly dating single mother. As a result Max has his imagination to retreat to, and when his mother chastises him for standing on their kitchen table proclaiming himself a king, he runs away from home. His flight transforming him not unlike Dorothy in 'Wizard of Oz', into his own fantasy world of his subconscious mind. In addition, on the DVD there's a 22mins short film 'Higglety Pigglety Pop', another Maurice Sendak adaptation, from Oscar-nominated Canadian filmmakers Chris Lavis and Maciek Szczerbowski ("Madame Tutli-Putli") - a very idiosyncratic National Film Board of Canada short film commissioned specifically for the DVD. Like Wild Things, tonally it specifically stears away from the traditional children's picture, in this case something more in the company of Terry Gilliam's wild sense of imagination.